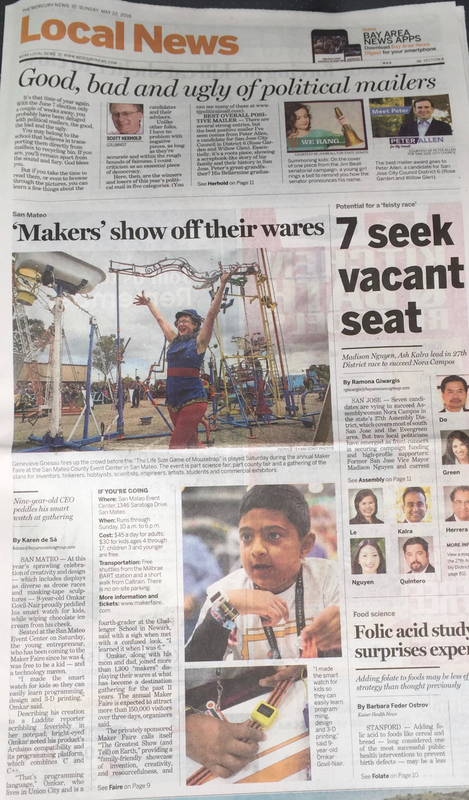 Every kid should make something and exhibit at Maker Faire! Maker Faire Bay Area is one of the few events where kids of all ages get to show off their creations to a large audience and get a chance to meet makers, inventors and leaders from all over the globe. And this year it was bigger and better! For Omkar (a huge fan of Mythbusters), the absolute highlight of the event was meeting Adam Savage! The biggest shout out for Omkar’s project came from none other than Massimo Banzi, the co-founder of Arduino, who talked about Omkar and O Watch in his annual State of Arduino address (at 15:30 in this video)! The best part of Maker Faire is meeting old maker friends and making new ones, not to mention experiencing all the cool exhibits and activities. Fillet Gauge Tool by Tuna who came all the way from Turkey and won a ‘Best in Class’ award for his creation. Mark you calendars for the next Maker Faire or similar event near you and encourage+help your child make and exhibit something. It’s just an awesome experience for kids! Nothing quite like Maker Faire Bay Area. The folks at Particle (erstwhile Spark) are awesome – they make great IoT products and are really super nice people. They gifted Omkar a Photon at the MakerFaire. His summer break just started and this was his priority #1. Omkar wanted a way to know when someone mentions or follows @IoT4Kids. Particle makes this incredibly easy to do with just a few lines of code. You essentially can make any action happen (light up or move something and/or make some noise) based on Twitter activity using their Arduino compatible WiFi integrated micro-controller and their integration with IFTTT. This simple example lights up an LED. BTW, the display box is 3D printed using Printrbot Simple which is another awesome product for kids to get started with 3D printing. This is all made so easy with the Particle Spark.Function() that is triggered ‘automagically’ 🙂 from IFTTT. All you need is the code below and create a recipe with Twitter trigger and Particle action. Here is a more fun example of this by Brian Sherwin. He also has an example of making this with your own node.js application to make the action trigger immediately instead of the 15 min cycle on IFTTT. So folks, if you liked this please follow or mention @IoT4Kids and light up Omkar’s day. :). Truly the greatest show on earth! That’s Omkar’s statement after exhibiting his O Watch as a maker for the first time at Maker Faire 2015 Bay Area. Thanks to the organizers, volunteers and all the amazing makers, attendees and exhibitors for the encouragement and support.